The Continuum edition of Ehrman's Misquoting Jesus, under the title Whose Word Is It?, may now be available in an edition without any Hebrew on the cover. See here. If, as I suspect, the Continuum edition with enlarged inverted Hebrew is the earlier edition of Whose Word then it may become a collector's item. However, as I have not yet encountered either of these editions in 3D I will await news of any information from sightings. It is amazing how often Hebrew gets printed up-side down. I blame the lameds myself. 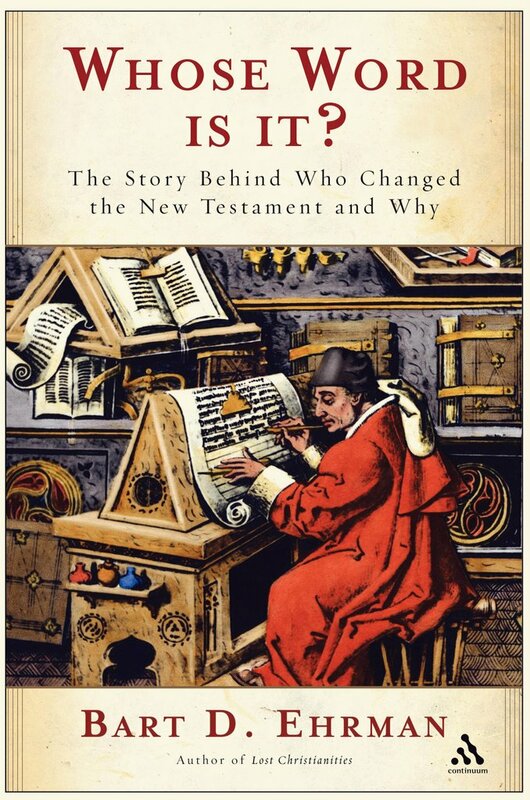 I just think it's funny that they put Hebrew on a book that is entirely about the New Testament. Ehrman's revision of Metzger -- which in theory primarily should be concerned with the original Greek form of the text -- displays a leaf from a well-known illuminated Vulgate MS.
(At least it didn't disply a leaf from the Gospel of Thomas or Judas). What is supposed to be the answer to the question 'Whose Word is it?'? What's happened to the Majority Text Society? How short is an opusculum/suntagmation? Last twelve verses of Mark: Original or not?